Lowest prices all the time, guaranteed! If you find a better price, let us know. 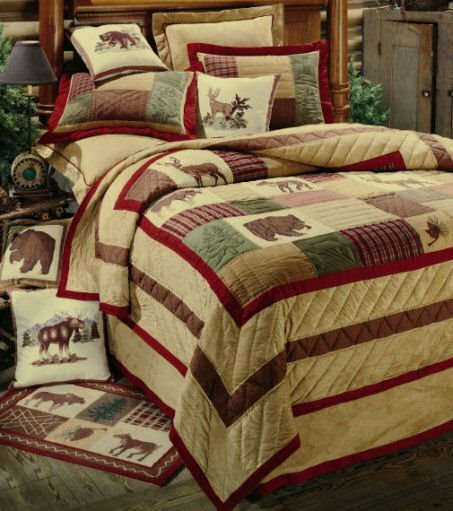 This is a traditional quilt pattern combined with fine details and lovely wooden tones. Accessories in animal motiffs finish off this ensemble. The close quilting and detail has a luxurious look. Prewashed. Has a plush feel with a faux suede. The Brick color from our solid Quilted Matelasse collection is a coordinate. 64" x 86" twin quilt. Cotton filled. By C & F Enterprises. Allow approx. 3 weeks delivery on this item. See the complete list of items in the Big Sky ensemble. 86" x 86" full/queen quilt. Cotton filled. By C & F Enterprises. Allow approx. 3 weeks delivery on this item. See the complete list of items in the Big Sky ensemble. 100" x 90" king quilt. Cotton filled. By C & F Enterprises. Allow approx. 3 weeks delivery on this item. See the complete list of items in the Big Sky ensemble. 21" x 27" standard sham. Flanged edge. By C & F Enterprises. Allow approx. 3 weeks delivery on this item. See the complete list of items in the Big Sky ensemble. 26" x 26" euro sham in Tan Faux Suede with Red. Flanged edge. By C & F Enterprises. Designed to be used behind standard sham. Allow approx. 3 weeks delivery on this item. 39" x 76" tailored 14" drop bedskirt in Tan Faux Suede with Red. By C & F Enterprises. Allow approx. 3 weeks delivery on this item. 60" x 80" tailored 14" drop bedskirt in Tan Faux Suede with Red. By C & F Enterprises. Allow approx. 3 weeks delivery on this item. 78" x 80" tailored 14" drop bedskirt in Tan Faux Suede with Red. By C & F Enterprises. Allow approx. 3 weeks delivery on this item. 14" x 14" bear pillow. 100% cotton face. By C & F Enterprises. Allow approx. 3 weeks delivery on this item. See the complete list of items in the Big Sky ensemble. 50" x 60" throw. Cotton filled. By C & F Enterprises. Allow approx. 3 weeks delivery on this item. See the complete list of items in the Big Sky ensemble.